For the Tech CARS Award for “Best App or Mobile Website for Finding Car Repair Info Prices and Quotes” the competition was very close and competitive. The three nominees all offer quality repairs, guarantees and fair prices. The global automotive aftermarket is expected to reach $486.36 billion US. by 2025, according to a new report by Grand View Research, Inc. Digitalization of automotive repair & component sales complemented by advanced technology incorporations in the automobile aftermarket component manufacturing is expected to boost the market growth. The global automotive aftermarket is expected to witness tremendous growth due to an upsurge in the number of vehicle collisions along with the inclination of owners toward repair of their automobiles. We at AUTO Connected Car News tried many mechanics until we found one that who is totally trust worthy and at a good price. The following apps, websites and services offer ways to find the best mechanic and best prices to service or fix your car. If you don’t service your car, you will more likely to needed more costly repairs in the future. Openbay came in third place. 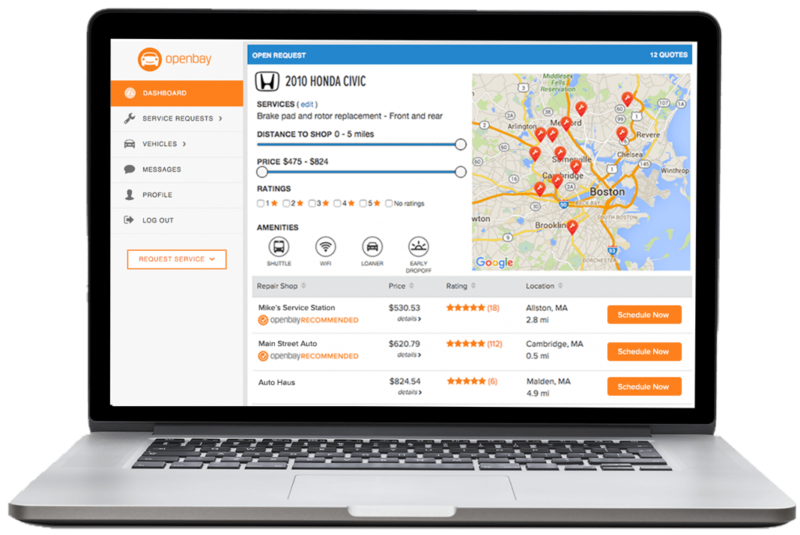 Openbay works by zip code offers a variety of service providers to ensure the customer has options when it comes to selecting the right provider for their vehicle. Mechanics receive extensive vetting, must have insurance, have been in operation for 6 months or more, offer parts and/or service warranty, charge fair prices,offer superior customer service and have ASE, Manufacturer, or Mechanical certified technicians. Openbay recently announced that they will offer an OBD-II device (Openbay Connect) and app to analyze diagnostic codes. Users can book appointments an pay through the Openbay app. In second place is YourMechanic that brings mechanics to the car owners 7 days a week. Services include a one year 12,000 mile warranty and free quotes for over 500 automotive repair services with mechanics in over 700 cities. The company claims both men and women pay the same prices for the same services. In October YourMechanic began offering a chatbot for expert advice from certified mechanics. Before scheduling an appointment, the customer can read ratings and reviews of the mechanic. The flat-rate quote doesn’t change, the company says, even if the job takes longer than anticipated. YourMechanic was a finalist for the best startup for AutoMobility LA. YourMechanic was founded in 2012 by Art Agrawal (Co-founder) and Dongyi Liao (CTO). Online questions help user diagnose chugs, wobbles, check engine lights, starting problems, stuck door and engine knocks. The winner in the categorey “Best Automotive Repair Referral App or Website,” RepairPal has close relationships with consumers, mechanics and major partners including Cars.com, Consumer Reports and US News Automotive. Before buying a car, RepairPal offers a repair cost index score to help calculate how much it cost to fix and maintain it.. For example, a BMW 335i xDrive has a score of 66 and a $1123 annual repair cost while a Toyota Corolla has a rating of 21 and an average annual repair cost of $341. RepairPal also offers an online tool to track repair maintenance. RepairPal uses national and regional data to insure fair pricing. Services are guaranteed for 24,000 miles or two years. Our votes showed acknowledgment for RepairPal services. RepairPal is pleased that the company won a Tech CARS Award. “Thank you for the fantastic news. We’re so happy to have won in this category. RepairPal has been working hard for the past decade to bring trust and transparency to the auto repair industry. We’re excited to continue instilling confidence in consumers when it comes to car repair, and with their help, and the help our incredible network of Certified shops, we hope to take the mystery out of car repair once and for all.” wrote Kimberlea Buczeke, Community and Content Manager at RepairPal in an email to AUTO Connected Car News. Founded in 2007 in San Francisco, CA, RepairPal provides consumers a quick, fair estimate that’s tailored to their vehicle and where they live. RepairPal is also host to a network of over 1,800 repair shops across the nation that have undergone a rigorous certification process, ensuring fair pricing and trustworthy work for everyone who walks in the door. RepairPal.com recently announced the launch of the all new Symptom Guide, an online tool for people to diagnose problems with their car. The tool answers questions that may puzzle you, such as “why won’t my car start?” and “why is my check engine light on?” You’ll be lead through a helpful, step-by-step guide and by the end, you can figure out some possible solutions to your problem, or be better prepared when you head to your local Certified shop with some knowledge about the issue. Winners were chosen by popular votes from readers of AUTO Connected Car News using sophisticated polling software that allowed voters to leave comments and blocked out spammers. If your in-box is too stuffed, the connected car news weekly summary contains all the news of the week. Winners please follow our our the rules and permissions‘ guidelines for usage winning. Basically, all we ask for is that your content be professional and you link back to AUTO Connected Car News’ homepage with every your win.